HUD AWARDS UNITED WAY HOUSING GRANT – United Way of Central Alabama, Inc.
Last year, United Way Housing Alliance member agencies operating in Alabama, Georgia and Mississippi provided housing counseling services to 10,231 individuals and families. 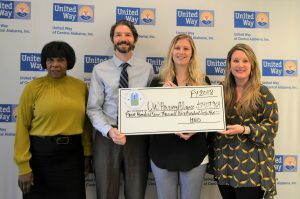 Since 2014, United Way’s Housing Alliance has been approved by HUD as a regional Intermediary, which oversees and supports a network of eight HUD-approved Housing Counseling agencies that serve individuals and families in need of housing assistance. Based on the belief that safe, stable, affordable housing is a basic human right, we are on a mission to increase the organized capacity of our Housing Counseling agencies to improve housing access and stability in their communities. If your organization provides housing counseling services and is interested in learning more about the United Way Housing Alliance network, please contact hud@uwca.org. Please visit our website here: https://uwca.org/housingalliance/.